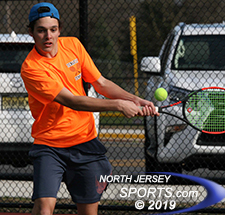 Alex Merson posted a straight sets victory at second singles for Tenafly, which swept Pascack Hills on Thursday afternoon. MONTVALE – When a team has four freshmen and a sophomore occupying first doubles and all three singles spots, the general expectation is that team is rebuilding for the future. Tenafly head coach Anthony Zorovich is running that youthful line out to the court this season, but make no mistake, this is not a team resigned to the rebuilding process. The Tigers are looking to win some championships. Despite the lack of big-match experience on the varsity level the talent and desire to be the champions leaves both the future and the present equally bright for the Tigers. Facing an equally young but gritty Pascack Hills squad, Tenafly took control early and kept their foot on the gas pedal throughout. They did not drop a set in any of their matches en route to a 5-0 sweep on Thursday at Pascack Hills High School in Montvale. The Tigers’ success starts at the top with freshman sensation Juju Wu, who plays with the poise of a senior. The steady-handed Wu was comfortable in all aspects of his game and only had a handful of unforced errors even with a stiff wind blowing throughout his 6-0, 6-2 victory. David Topchishvili, one of only two seniors in Tenafly's starting lineup, was part of a hard-fought victory at second doubles. Wu was quickly followed off the court by a solid performance from Jon Tsipunyuk at third singles. He came out on the attack and never looked back to win his match 6-1, 6-2. The key to the Tigers’ success is not just their budding talent but also the balance they have up and down the lineup. Luke Han and Andrew Kim, both freshmen, were aggressive at the net and used that approach to score a late break in the second set to score the clinching point. Alex Merson showed off his ability to play any style at second singles. He was successful with a wide variety of shots from the baseline in a straight-set win. 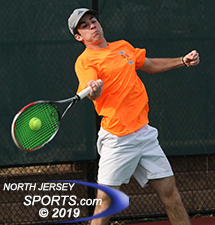 Tenafly’s final point did not come easy as the Cowboys’ duo of Ben Steinberg and Danny Leong put up a fight at second doubles. After not converting on their first four set points Kevin Clifford nailed a service winner and his partner David Topchishvili, the only two seniors in Tenafly’s starting lineup, came up with a drop volley to take the first set. They were at it again late in the second set winning the final five points of the tiebreaker for a 7-5, 7-6 (7-3) victory to close out the sweep. Facing tough competition is what helps a team grow in the long run. That is what Pascack Hills’ head coach Eric Ganz is hoping for as his team, (like Tenafly’s) is largely filled with freshmen and sophomores. Tenafly had loaded up its schedule with Bergen County stalwarts like Ridgewood and Bergen Tech along with state powerhouse teams like Montclair, Delbarton, and Livingston. That is to prepare for the Tigers for runs at county, section and state titles.